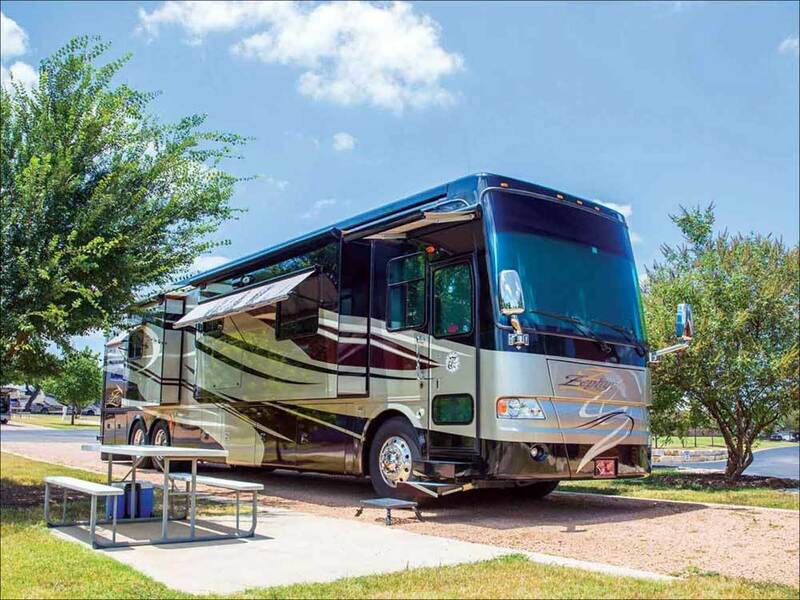 This all-age luxury RV resort is located near the vibrant metropolis of Austin, the 'live music capital of the world!' Amenities include swimming pools, hot tub, putting green, and pavilion for planned activities and events. This place was awesome, All of the staff, I hate calling them employees Because these people where so nice and helpful. We had a great time, Thank you to all of the people at La Hacienda. We love everything about this place. Friendly staff. Very convenient location. Beautiful manicured grounds and facilities. Clean restrooms. Great gym, pool, game room facilities. Quiet. A lot of permanent residents so very few sites available to short term visitors. Stayed in a 45 ft. motorhome. Pull-thru big enough for rig and toad. Reasonably level crushed stone. This park is "sort-of" big rig friendly ... some corners are tight and there are big rocks placed too close to the corners. Close to shopping and restaurants. Quiet park. Nice area to visit. We have stayed at La Hacienda many times in the past and had always enjoyed our stay there. The park recently changed ownership and does not appear to be as well kept as in the past. Trees, shrubs and grass are dying due to lack of water. The sewer on our site was full, with toilet paper (and over-flow) all around the pipe from the last RVer. The gravel on our site was not level, and in some places, non-existent. The park personnel are in the process of building new tables/benches for the sites, but their efforts should be focused on maintaining the grounds first! The park caters to long-term residents, and because the residents are allowed to fill their sites with potted plants, temporary fences, atvs, and such, the park appears to be 'cluttered'. The only positive thing I can say is that the staff are friendly and the bathrooms and laundry facility are clean and well-kept. We have a 5th wheel trailer and stayed in a pull-thru site, travelling with our canine companion.